Anna Kajumulo Tibaijuka (/tiːbaɪdʒuːkæ/; born 12 October 1950) is a Tanzanian, CCM politician and Member of Parliament for Muleba South constituency since 2010. She served as the Minister of Lands, Housing and Human Settlement Developments from 2010 to 2014. She is also a former under-secretary-general of the United Nations and executive director of the United Nations Human Settlements Programme (UN-HABITAT). She was the second highest ranking African woman in the UN system until her resignation in 2010 to run for political office in Tanzania. Born in Muleba, Tanzania, to small-holder farmers, Tibaijuka studied agricultural economics at the Swedish University of Agricultural Sciences in Uppsala. She is fluent in English, Swahili, Swedish and French. She is the widow of the former Tanzanian ambassador, Wilson Tibaijuka, who died in 2000. She is the second highest ranking African woman in the UN after Dr Asha-Rose Migiro, the deputy UN secretary general, who is also a Tanzanian. In the national election, held October, 2010, she became MP for CCM, Muleba District in Kagera Region. From 1993 to 1998, Tibaijuka was associate professor of economics at the University of Dar es Salaam. 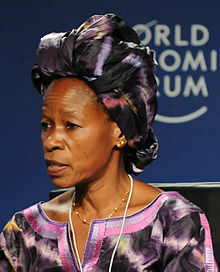 During this period, she was also a member of the Tanzanian government delegation to several United Nations summits, including the United Nations Conference on Human Settlements ( Istanbul, 1996); the World Food Summit (Rome, 1996); the Fourth World Conference on Women (Beijing, 1995) and the World Summit for Social Development (Copenhagen, 1995). At the World Food Summit in Rome, she was elected coordinator for Eastern Africa in the Network for Food Security, Trade and Sustainable Development (COASAD). Tibaijuka has also been a board member of UNESCO's International Scientific Advisory Board since November, 1997. She is a foreign member of the Royal Swedish Academy of Agriculture and Forestry. In September, 2000, she was appointed by Secretary-General Kofi Annan, as executive- director of the United Nations Centre for Human Settlements. During her first two years in office, Tibaijuka oversaw major reforms which resulted in the United Nations General Assembly upgrading the Centre to programme status and renaming it the United Nations Human Settlements Programme (UN-HABITAT). Tibaijuka was elected by the General Assembly to her first four-year term as head of the new agency in July, 2002 and was given the rank of under-secretary-general, as the first and only African woman to reach this level within the UN system. In June 2005, the secretary general appointed Tibaijuka as his special envoy to study the impact of the Zimbabwean government's campaign (known as Operation Murambatsvina) to evict informal traders and people deemed to be squatting illegally in certain areas. As the evictions were concentrated on areas which had traditionally strongly supported the oppositional Movement for Democratic Change, many commentators believed the campaign was politically motivated. Although this was denied by the Zimbabwean government, there was strong international criticism. Tibaijuka concluded her report saying that “while purporting to target illegal dwellings and structures and to clamp down on alleged illicit activities, [the operation] was carried out in an indiscriminate and unjustified manner, with indifference to human suffering”. The steering committee of the Water Supply and Sanitation Collaborative Council elected Anna Tibaijuka as its new chair on 19 October 2010. Tibaijuka succeeded Roberto Lenton, whose second and final term of office ended in March 2011. In 2004 the British prime minister, Tony Blair, invited Tibaijuka to be a member of the Commission for Africa, which he established to generate ideas and action to accelerate and sustain Africa's growth and development. The Commission, comprising 16 internationally known figures, completed its report in March 2005. In December 2014, President of the United Republic of Tanzania Dr. Jakaya Kikwete sacked Tibaijuka from a post of Minister for Lands, Housing and Human Settlement Development over her alleged involvement in the USD 250 million Tegeta escrow account scandal. Kikwete said he had asked Tibaijuka to “leave room for a new appointee,” after she had not shown "due diligence" when receiving USD 1 million from James Rugemalira of VIP Engineering and Marketing (VIPEM) linked to the scandal. Tibaijuka had tried to defend herself that the money was a donation for the "Johansson Girls Education Trust" and that she had forwarded it after receiving it on a personal account. In 2015 she was renominated by 63% of regional CCM members to run again for the parliamentary seat of Muleba South. She won the election and returned to the parliament. ^ "Member of Parliament CV". Parliament of Tanzania. Retrieved 6 September 2013. ^ Williams, Donald C. (2012). Global Urban Growth: A Reference Handbook: A Reference Handbook. ABC-CLIO. pp. 119–. ISBN 978-1-59884-442-9. ^ "Member Register". Royal Swedish Academy of Agriculture and Forestry. 2004. Retrieved 7 February 2013. ^ "Former Executive Director". UN-Habitat. Retrieved 20 February 2017. ^ "Secretary-General appoints special envoy to review Zimbabwe's housing evictions". UN News Centre. 20 June 2005. Retrieved 20 February 2017. ^ "Tibaijuka walks into real politics". Daily Nation. 4 September 2010. Retrieved 20 February 2017. ^ "Former Executive Director of UN-HABITAT, Professor Anna Tibaijuka, to Chair the Water Supply and Sanitation Collaborative Council". PR Newswire. 15 October 2010. Retrieved 20 February 2017. ^ "Commission for Africa Is Launched by PM Tony Blair: Panel Discusses Brandt and Sets Development Agenda". GPF. 14 May 2004. Retrieved 20 February 2017. ^ "Award Winner 2009". Gothenburg Award for Sustainable Development. 2009. Retrieved 16 March 2017. ^ "Former WSSCC Chair receives award for Sustainable Development". WSSCC. 24 September 2016. Retrieved 15 March 2017. ^ "List of McGill Honorary Degree Recipients from 1935 to Fall 2016" (PDF). McGill University. 7 November 2016. Retrieved 16 March 2017. ^ "Heriot-Watt University Honorary Graduates" (PDF). Heriot-Watt University. 2016. Retrieved 16 March 2017. ^ "Dr Anna Tibaijuka, UN Under Secretary-General, to be awarded UCL honorary degree". UCL. 14 March 2006. Retrieved 7 February 2013. ^ "Address by Dr. Tibaijuka on being conferred an Honorary Degree by SABS" (PDF). UN–HABITAT. 27 July 2007. Retrieved 16 March 2017. ^ Marek Bryx (20 November 2009). "Laudacja z okazji nadania tytułu doktora honoris causa SGH pani Annie Kajmulo Tibaijuka" (PDF) (in Polish). Retrieved 16 March 2017. ^ "Catholic university fetes UN-HABITAT Executive Director". UN–HABITAT. 12 February 2010. Retrieved 16 March 2017. ^ "Strategy of "going out and taking in" implemented". Newsletter vol. 68. Tongji University. 31 December 2010. Retrieved 16 March 2017. Wikimedia Commons has media related to Anna Tibaijuka.